November 2002, Sony released Ratchet & Clank for the PlayStation 2, which was quite arguably one of the best platform adventure games for the system. The first game in this epic franchise introduced many features, which went on to become a staple of the series in subsequent games. Some of these features included the ability to purchase weapons, items and unlocking gadgets as you progressed throughout the game. It has now been 14 years since the launch of Ratchet & Clank and Insomniac Games’ most prolific franchise is set to debut on the PlayStation 4. 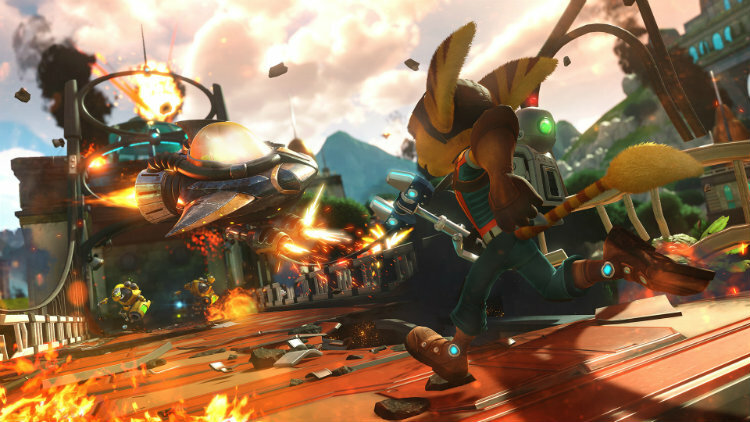 First announced at E3 2014, Ratchet & Clank is a new game based on elements from the original PlayStation 2 game, featuring new locations, bosses, weapons, and more than an hour of new cinematics. Developed alongside the major motion CG-animated picture that is now in theaters, join Ratchet, Clank, Captain Qwark and new friends as they embark on intergalactic adventure as you play the game, based on the movie, based on the game! If you’ve played the original PlayStation 2 masterpiece then the plot of Ratchet & Clank will feel very familiar. You still get the same genuine, lighthearted story that works well as a complement to the amazingly fun gameplay. 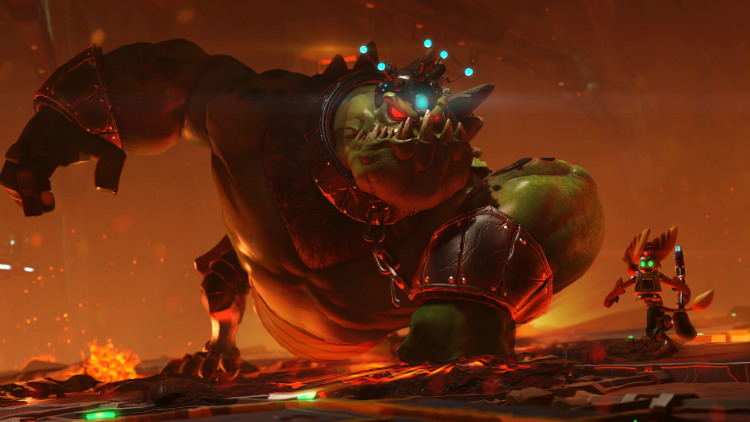 The story goes back to the origins where Ratchet and Clank meet and team up for the first time to take on the villainous Chairman Drek and his forces. Ratchet & Clank is narrated by the delightfully oblivious Captain Quark, which had me laughing so hard I was crying tears of joy. Series veterans will be happy to know that Ratchet & Clank contains a twist in the storytelling that works very well for those who have played the original games. 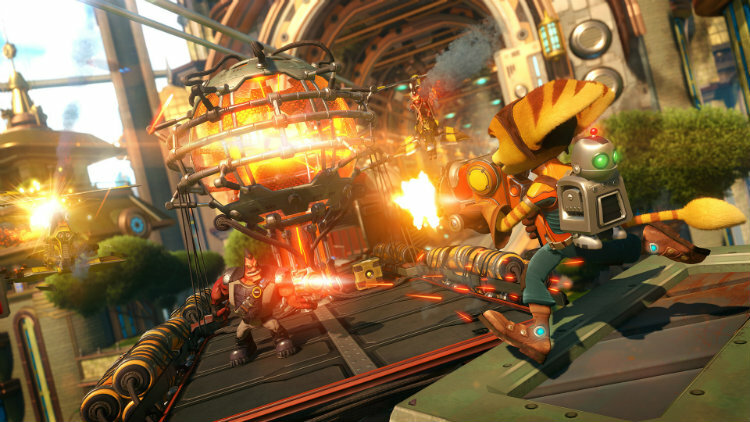 The same loveable, tried and true gameplay returns that makes Ratchet & Clank a blast to play. 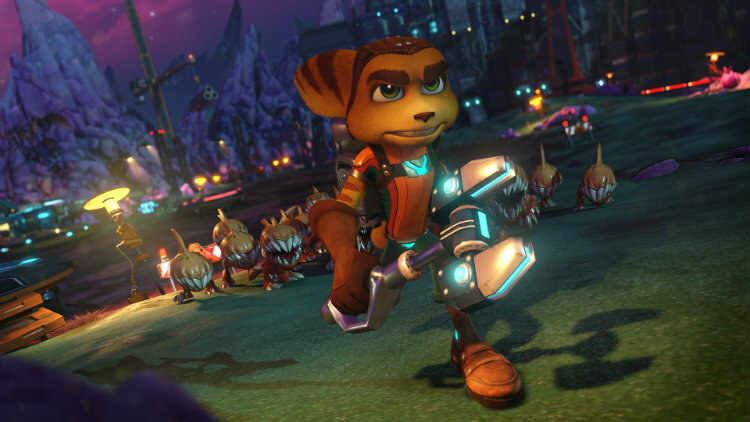 Ratchet, with the power of his OmniWrench 8000 can beat down enemies with hack ‘n’ slash type gameplay. This makes Ratchet effective against the hordes of smaller monsters, which can be used with ground slamming attacks, but there are also stronger enemies that are harder to hit with this short-range weapon, which is where the other weapons really come into play. The majority of your weapons throughout the game must be purchased at the Gadgetron vendor stations. There you will find a wide variety of weapons that will help you destroy pretty much everything you can in the game. Most of the weapons from the original game are present in this PlayStation 4 masterpiece; however, you’ll notice some weapons like the Sheepinator and the Groovitron from later games are available for purchase. Each weapon can be leveled up and upgraded, which gives the weapons new capabilities preventing the weapons from feeling overly repetitive as you progress through the game. The more you use a particular weapon the stronger it will become, and by using the collected crystals, you can improve your weapon’s range, speed, and other areas. Ratchet & Clank features a number of gadgets that you can unlock while playing the game to use in different areas. Take for example the Hoverboard, it will allow you to compete in racing segments, and just as with the weapons some gadgets that did not debut until later in the series are present. It’s additions such as these, which make Ratchet & Clank feel very expansive to newcomers, while also offering enough to get veteran players to come back for another try. Not only will these gadgets help you progress through the main story, but also will allow you to reach inaccessible areas that require you to come back later with a specific item to continue. These typically involve finding the collectible Holocards in the game, which adds a replay value to the experience. Every Ratchet & Clank game has had impressive visuals for its time, and Ratchet & Clank on the PlayStation 4 does not fail to impress. The colourful designs allow the gorgeous landscapes to prosper, and the level of detail on the character models is absolutely amazing. The fur on Ratchet and the shine off Clank is certainly a remarkable sight. 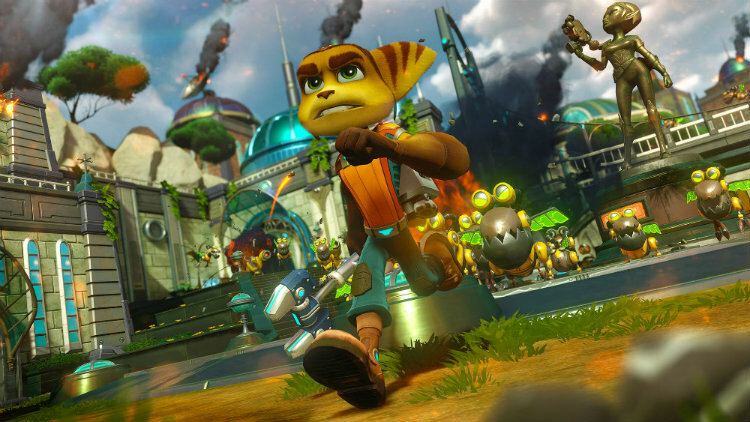 Having been a fan of the franchise since its inception on the PlayStation 2, Ratchet & Clank on the PlayStation 4 is everything that we’ve all come to know and love about these series. Combining the signature platform adventure gameplay and humor the franchise is known for with new narrative details, planets, gameplay sequences, bosses and weapons—Ratchet & Clank is one of the best platform adventure games on the PlayStation 4.